LAS VEGAS (January 17, 2019) - World title challenger "Mighty" Aston Palicte (24-2-1, 20 KOs) is fighting to establish his Filipino boxing legacy, starting January 31st, when he takes on unbeaten Jose "Chiquiro" Martinez (20-0-2, 13 KOs) in a World Boxing Organization (WBO) junior bantamweight world title eliminator. 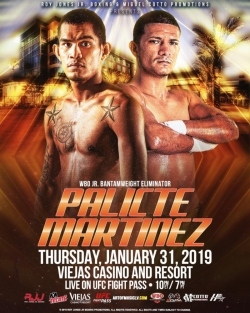 Co-promoted by Roy Jones Jr. (RJJ) Boxing Promotions and Miguel Cotto Promotions, Palicte vs. Martinez will headline a card that will stream live on UFC FIGHT PASS on Thursday, January 31, 2019, live from Viejas Casino & Resort in Alpine, California, starting at 10 p.m. ET / 7 p.m. PT. The show is the first under a new agreement between Palicte's promoter, RJJ Boxing, and FIGHT PASS, to live stream up to 72 professional boxing events over the next three years. The event will be held on the Thursday night of Super Bowl week, in the Oak Ballroom at Viejas Casino & Resort, which is located 35 miles outside of San Diego. On the line is the mandatory challenger status for the winner of the Palicte vs. Martinez 12-round main event for reigning WBO junior bantamweight title holder and four-division world champion, Donnie Nietes (42-1-5, 24 KO), one of the all-time greatest Filipino fighters. Palicte (WBO No. 2) is coming off a controversial 12-round split draw with Nietes last September in Inglewood, California, for the then vacant WBO Junior bantamweight championship. Many at ringside felt that Palicte should have won the Filipino showdown, based on his relentless pressure and considerably higher activity rate. "I felt like I won the fight," Palicte said, "but a draw is better than a loss. I expected to win that fight. I got him good in the early round, his face was all swollen, but I respect the judges' decision. I can't do anything about that now, but we will have a rematch if I defeat Martinez. "I was disappointed to learn we were not going to have an immediate rematch like I had thought, but this fight will be good preparation for me to fight Nietes again for the world title. Of course, I need to win this fight and it's very important, because a win will draw me closer to my dream of being world champion. Martinez (WBO #4) is a good fighter, but I'm confident I can win this fight. I'm still very hungry. I missed the first time but, this time, I'm not letting it go. A win and I will be challenging Nietes and this time around I will strip him of the world title belt." Palicite, who is ranked No. 9 in independent world ratings by The Ring magazine, has been training at the famed Wild Card Gym in Hollywood, California, along with superstar Manny Pacquiao, who is training there for his Jan. 19th showdown with Adrien Broner. "It's good to be back in the U.S. to fight again," Palicte commented. "It's a bit sad because I'm away from my whole family, but I still get to talk to them every day. I'm a husband and father of my year-old boy. They are my reason for striving harder in my boxing career for the future of my family. They're my inspiration and reason why I'm here now." Palicte's native Philippines has produced great boxers for the past century, dating back to Pancho Villa, continuing with Flash Elorde, and now peaking with Pacquiao, Nonito Donaire and Nietes. The 27-year-old Palicte is the undisputed leader of the contemporary wave of young world-class Filipino fighters, which brings honor, pride and, of course, added pressure. Although he isn't looking past Martinez, far from it, Palcite is confident of defeating Martinez and then Nietes for the coveted crown. "There is pressure to be the next great Filipino fighter," Palcite admitted. "I've been waiting for this my whole life. I nearly did it (win world title) the last time and I'm not stopping until I get that world title belt. I had hoped to get it the first time, but I think it's going to be sweeter the second time around." Tickets are priced at $65.00, $55.00 and $45.00 and available to purchase by going online at www.viejas.com.